KASC is now accepting proposals to present at the 2019 KASC Conference, Together for a Brighter Future. This year’s conference will be held September 10-11, 2019, at the Marriott Griffin Gate in Lexington. Proposals should be submitted by April 24, 2019. The Program Committee will give priority to proposals that promote dynamic and engaging learning opportunities for attendees. In addition, special consideration will be given to sessions that include students in the presentation (students may attend at no cost). Sessions should model the research-based, interactive, engaging, and rigorous instruction we strive for in each Kentucky classroom. We encourage interactive sessions where presenters foster dialogue and exchange, and do not simply use a “stand and deliver” approach. Be sure to check our Tips for Engaging Sessions. Address how members of the school community work together for the sake of improving student achievement. Address a classroom or school wide approach, strategy, program, or innovation that has been proven successful in increasing student achievement. Explain how his or her work has been implemented in a classroom, school, or district. Show how an innovative strategy addresses a challenge. Provide tangible takeaways and immediately applicable information. We look forward to your conference proposal submission before April 24, 2019. 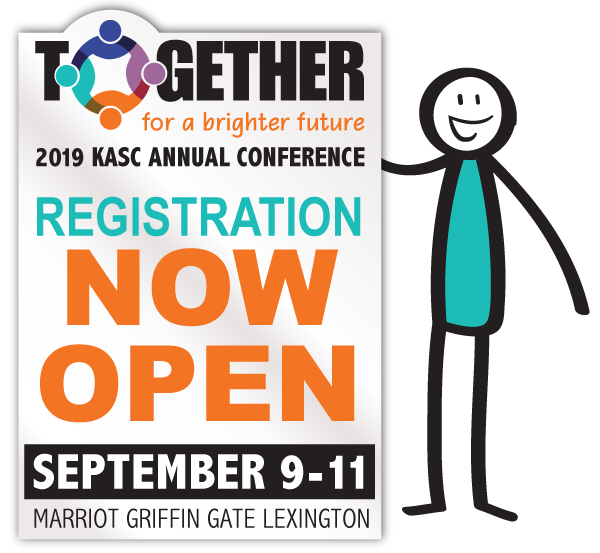 Let’s make the 2019 KASC Conference, Together for a Brighter Future, the best one yet with you as a presenter!